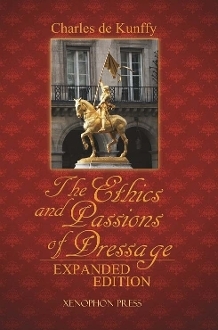 Ethics and Passions of Dressage Expanded Ed. Part Number:Ethics and Passions of Dressage Expanded Ed. De Kunffy explains the true meanings of: non-confrontational riding and training, “on the bit,” engagement, the development of the correct seat, and the use of hands and reins. He offers valuable advice on seeking instruction in classical dressage training. In the chapter entitled “Succinct Principles,” de Kunffy doubles his single sentences kernels of wisdom from the first edition. This monumental contribution to equestrian literature is embellished with even more carefully-selected images of equestrian statues than the original edition. The Ethics and Passions of Dressage, Expanded Edition also includes additional chapters, Recommended for the serious equestrian wanting to be simultaneously challenged and inspired. This book is sure to reaffirm the rider’s dedication to an ethical approach to classical dressage.